Superfi closes stores nationwide | What Hi-Fi? Specialist audio-visual retailer Superfi ceased trading on 4th February and is believed to have closed its six stores across the UK. In an email to its suppliers, Superfi said "we have filed notice of intention to appoint an administrator to the business on 5th February". We have contacted Superfi for further details, but to date the company has not replied. The email says all existing stock has been transferred to the firm's central warehouse. 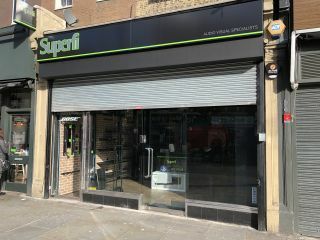 When we visited Superfi's London store in Camden high street (shown above) the front door was open and most of the stock had been removed. Inside, three workmen were removing the store fittings and clearing up. The chain also had stores in Birmingham, Manchester, Nottingham, Derby and Lincoln. When we telephoned them there was no answer. Superfi's website has been taken down. We will update this story with any additional information as soon as we get it.